This collection consists of records related to Iridium LLC, a commercial satellite communications system. 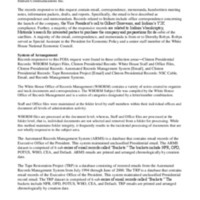 The records responsive to this request contain email, correspondence, memoranda, handwritten meeting notes, information packets, drafts, and reports. Records include topics related to Iridium's launch, Y2K compliance, bankruptcy, and de-orbit of the Iridium satellite constellation. Other related topics include but are not limited to Low Earth Orbit (LEO) Satellites, Motorola, Lockhead Martin, Sprint, Alexander Graham Bell, Gilbert Grosvenor, Vice President Al Gore, and the National Aeronautics and Space Administration (NASA).